Report from Planet Midnight, which was published by PM Press in 2012, collects two of Nalo Hopkinson's short stories along with an extended interview conducted by PM Press's editor (these interviews are part of the structure of all of PM Press's Outspoken Authors series), and a speech Hopkinson gave at the International Conference for the Fantastic in the Arts (ICFA) in 2010, on race in the science fiction and fantasy literary community. This speech received a great deal of attention at the time when it was initially given, as it was part of the long tail of responses to the conflict/event/conversation of early 2009 most easily referred to as RaceFail: a moment in which some of the racial faultlines in SFF fandom became visible to people who had previously had the privilege of ignoring them. "Report from Planet Midnight" (the speech) is a call to attention: it demands that the (largely white) members of both SFF fandom and SFF-oriented academia acknowledge and engage with their practices of institutional racism. Is Report from Planet Midnight (the book), then, a manifesto, curated as to create a programmatic exemplar of how to address race in SFF? Not, I would argue, precisely: the book is more a demonstration than a manifesto, a presentation and a description of one version of practicing the attention which is demanded in the "Report" and detailed in the final interview. This practice is most visible in "Shift," which reimagines The Tempest's Caliban and Ariel as explicitly Black versions of their Shakespearean antecedents. "Shift"'s Caliban is fleeing his mother, the Algerian witch Sycorax, across time and relationships, transforming himself into invisibility by becoming—shifting into—the form and aspect that each of his new (white and blonde and Miranda-esque) lovers recognize in him. He is mutable and formless; a kind of caricature of white desire for Blackness, but employing that formless mutability to protect himself. By contrast, "Shift"'s Ariel claims an explicitly Black Caribbean identity for herself which she uses as a weapon against what she believes to be her brother's failures of participation in his own Blackness (and his own family). Of genuine interest is the story's concluding image, where Caliban's current Miranda-alike rejects the entire premise of being herself an instrument of Caliban's self-definition, telling him to look her up once he himself knows who he is—suggesting, in a sense, that one of the options available to white people engaging with Blackness is to de-instrumentalize their own desire for it. In this context, the question of how "Message in a Bottle" is related to "Report from Planet Midnight" is a striking one—while "Shift" is straightforwardly connected to the attention-paying process of allowing race and racism to be visible in SFF, "Message in a Bottle" does not—to this reviewer, who is admittedly a (functionally) white woman—immediately suggest such connections. "Message in a Bottle"'s primary connection to "Report from Planet Midnight" is instead along a different axis: the question of the (impossible) disentangling of art/meaning from labor/effort. This is a central aspect of Hopkinson's speech: she writes, "So it seems to me that one of the things that fantasy and science fiction do is to imaginatively address the problem of who does the work [ . . . ] to use myth-making to examine and explore socioeconomically configured ethnoracial power imbalances" (pp. 56-57). In "Message in a Bottle," the protagonist, Greg (an artist), encounters, in the person of the adopted disabled child of his friends, a possibly alien messenger from the future, who is here in Greg's present to acquire artistic production for preservation in that future—or at least that's the science fiction part of the story. The great majority of the story is about one man's negotiation with the idea of parenthood, of what is worth valuing in the world, of what kind of work is useful work. Greg begins as a staunchly childfree person, and moves through a sequence of shifts as he grows older and into himself—only to be shocked by the demands of a child/a symbolic future which make no sense to him as someone who ascribes value to the present. The question of the disentangling of art and labor, the work of parenting versus the work of curating versus the work of art- or meaning-making—i.e., the location of value—are central to Hopkinson's efforts in this story, and it is through this interrogation that the thematic link to "Report from Planet Midnight" is most visible. However, I suspect that it is disingenuous for me, a (functionally) white woman writer, to engage primarily with this collection by considering its stories within the rubric of science fiction and fantasy are engaged in asking questions about the location of labor and its relationship to utopia and to art; if I do that, I am making a marginally more sophisticated version of the mistake that Hopkinson's interlocutor at the 2010 ICFA did, when he—as Hopkinson reports at the conclusion to "Report from Planet Midnight"—came up to her at the end of her speech and asked, oh, are you a Marxist? As if the only response to questions about ethnoracial power imbalance is to demand that we instead talk about class and economic power imbalance—or worse, to fail to notice that a conversation is in fact about ethnoracial power imbalance at all: i.e., if I just spend this review talking about work, about value, then I am essentially opting out of doing some genuinely difficult and unpleasant work of my own: discussing race. Noticing race. This, of course, is the underpinning of Hopkinson's project: asking the question of who is doing the work . . . of engaging with race in SFF. Sadly, I think that even in 2016—four years after the publication of this collection and six years after its titular speech was given—that work is mostly being done by people of color. White people are still opting out. While I feel that the general atmosphere of SFF is slightly more hospitable to people of color in 2016 than it was in 2009—mostly in that a hell of a lot more of us white folks are aware that we have a problem, and occasionally in the presence of "visibility" projects, like Lightspeed's DESTROY issues—and while I'm glad that there is movement in the right direction, there hasn't been a sea-change, has there? 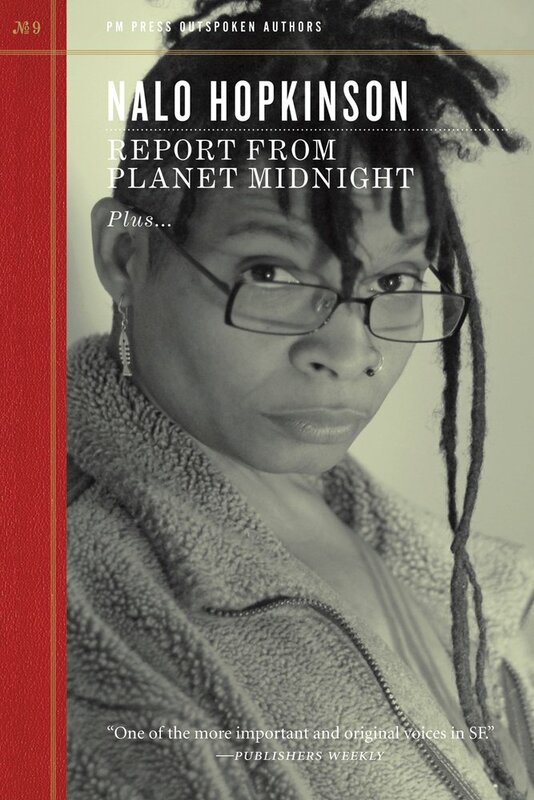 I cannot speak for the people of color in my community, but I can notice that the sort of attention that Hopkinson demands in "Report from Planet Midnight" is still being demanded by those people of color. We are still being asked to notice, and the people doing the heavy weight of asking are still, in the great majority, marginalized people. Furthermore, as I write this review, it occurs to me: is the kind of doing the work that is being done in a sense exploitative? Showing off that we (white people) know we have a problem? My impulse to want to talk about the work of Black Caribbean writers of SFF like Hopkinson the way I would talk about the work of a white writer (i.e. with attention to what is being attempted and where I can see failure and success, contextualized in my own praxis of reading) leads me straight into the trap of avoiding entirely the questions of race which this collection deliberately foregrounds. And thus I have written a review which is far more about me, a white woman, than it is about Hopkinson—I have committed a performative kind of noticing. So: still part of the problem, if possibly more informed about the deep roots of that problem.